A few months ago, I visited Singapore and noticed this incredible piece of art in the display of The Hour Glass shop in the Millenia Walk mall. This watch, an URWERK 103, was an incredible eye-catcher. Last week I received a presentation of URWERK’s latest creation, the UR103 Hexagon. It also included a technical description of this time piece. URWERK, founded in 1997 by Felix Baumgartner (watchmaker) and Martin Frei (artist), celebrates each new collection by 10 black watches. This year, URWERK introduces the new black platinum 103 Hexagon. 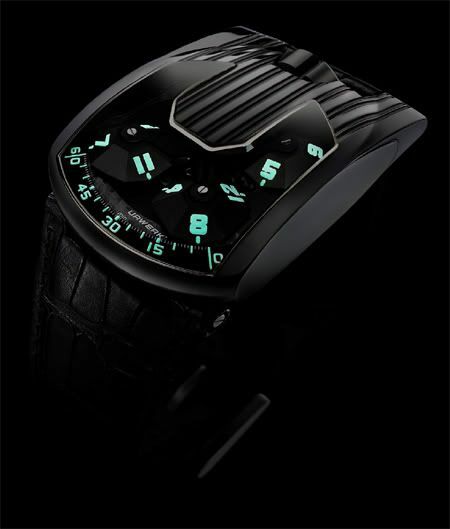 The birth of URWERK?¢Ç¨Ñ¢s ?Ç¬´Black?Ç¬ª limited editions goes back to 1999 with the presentation of a special version of URWERK?¢Ç¨Ñ¢s very first watch, – the UR102 ?¢Ç¨Äú which was clothed in black and called ?Ç¬´ Night Watch ?Ç¬ª. The concept was revived in 2006 with the now mythical ?Ç¬´ Black Bird ?Ç¬ª, a creation with combat aesthetics and a name derived from military aviation. The ?Ç¬´ Black Shark ?Ç¬ª followed in 2007. Today the UR103 ?Ç¬´ Hexagon ?Ç¬ª ?¢Ç¨Äú a limited edition of only 10 pieces ?¢Ç¨Äú takes its turn under the spotlight, with its black platinum case. Four orbiting and rotating satellites display the hours, with each satellite indicating the time in a both analogue and digital fashion as it arcs across the minute chapter.T he four hour-satellites of the UR-103 are crafted in aluminium and are suspended under a grade-2 titanium orbital cross. The complication is mounted on a non-magnetic ARCAP P40 base plate providing superior strength and stability to traditional metals. The hour-satellites complete a full revolution under the orbital cross every four hours. As the satellite approaches the crown position, an internal Geneva cross causes it to undergo a 120 degree rotation on its own axis. 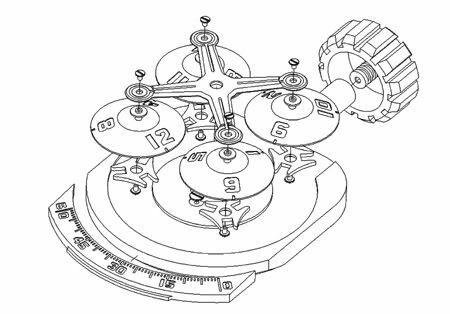 This 120 degree rotation positions the next hour for its turn indicating the time at the front of the dial. Movement: Calibre 3.03: hand winding; 21,600bph/3Hz; 43 hours power reserve. Control Board: Titanium; power reserve indicator; time regulating dials indicating 15 minutes and seconds; precision adjustment screw. Thanks to Yacine Sar of URWERK for documentation. URWERK has an official forum hosted by Horomundi.